A popular choice for use with Door Entry Systems. Simple to fit and suitable for most timber frames. The release is in a locked state without power. When the system applies power to the release it will unlock. This ensures that, in the event of power failure, the release will stay locked to ensure no degradation of security - and so make its operation "secure". 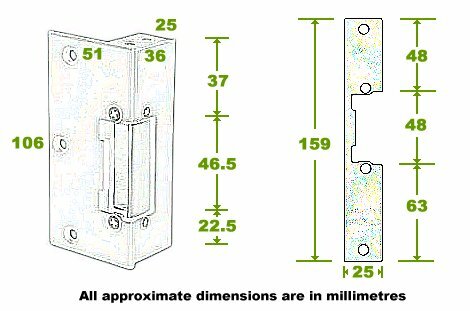 This version is often chosen for door entry systems where the door latch can be operated as normal to allow egress. The release is unlocked when there is no power. The system needs to apply constant power to the release to put it into its locked state - and momentarily disrupt power when access is desired. This ensures that, in the event of power failure, the release will unlock to allow access / egress e.g. building evacuation - and so make its operation "safe".